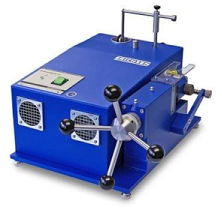 Fully automatic cupping and deep drawing cup test machine for testing the ductility of coated, ferrous and non-ferrous metals (e. g. coil coatings, lacquered, plastic coated or electroplated materials). The testing machine is provided with an electro-hydraulic drive and a maximum drawing force of 200 kN. The testing machine is equipped with manometers for indicating the sheet holder force and the drawing force. 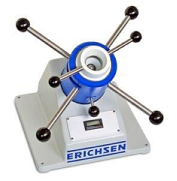 The drawing punch stroke is displayed digitally For testing lacquers and paints of all kinds for elasticity and adhesive quality using the Erichsen Cupping Test in conformity with DIN ISO 1520, ISO 1520, BS 3900:Part E4, NF T 30-019 and SIS 18 41 77 and deep drawing cup test. In acc. To ISO 1520. 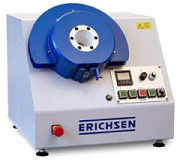 For testing lacquers and paints of all kinds for elasticity and adhesive quality using the Erichsen Cupping Test in conformity with DIN ISO 1520, ISO 1520, BS 3900:Part E4, NF T 30-019 and SIS 18 41 77 and deep drawing cup test in acc. To ASTM E 643-84, DIN EN 1669, ISO 11531 and ISO 1520. 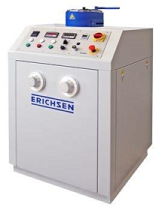 Simple and inexpensive mechanical testing machine for ERICHSEN Cupping Test on painted or plastic coated sheet metal specimens up to 1.25 mm thick.